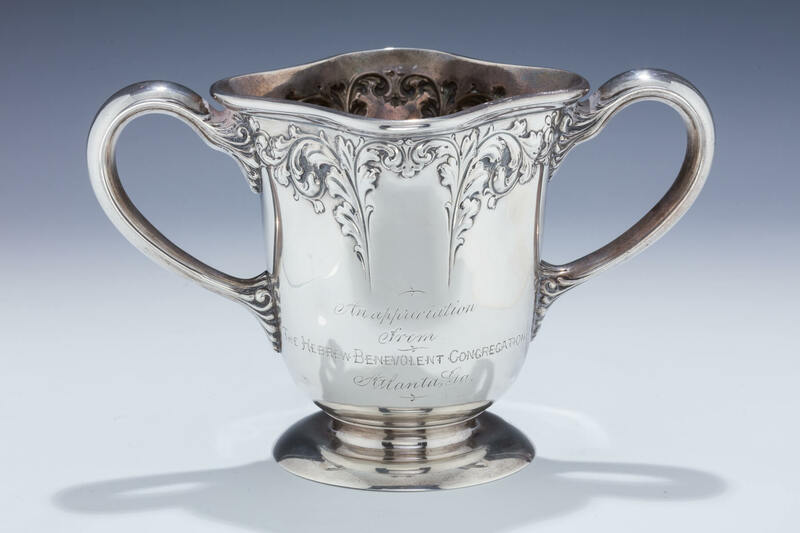 AN IMPORTANT STERLING SILVER TWO HANDLED CUP GIVEN BY THE HEBREW BENEVOLENT CONGREGATION OF ATLANTA. American, c. 1900. On a round foot. Main section chased with scrolling designs. 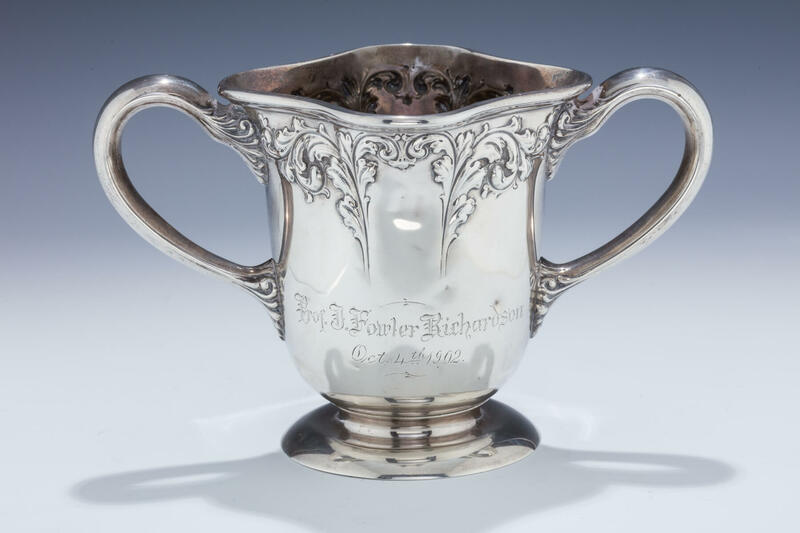 Engraved in English: “PROFESSOR J. FOWLER RICHARDSON OCTOBER 4, 1902. APPRECIATION FROM THE HEBREW BENEVOLENT CONGREGATION ATLANTA, GA” The Hebrew Benevolent Congregation was founded in 1867 (organized in 1860) as Atlanta’s first Jewish institution. In 1850, there were 26 Jews living in Atlanta and by the outbreak of the Civil War, there were 50. Their first building was dedicated in downtown Atlanta in 1875. Until 1895, the congregation varied observance between Reform and the more traditional. However, with the appointment of Rabbi David Marx in 1895, the Reform service became the official one. The synagogue grew and evolved, eventually becoming a platform for the civil rights movement during which they were bombed by a White Nationalist in 1958 with 50 sticks of dynamite. 5.4” tall, 9” wide and 17.5 ounces.